Snuggled in between Hyde Park and Green Park the five star InterContinental Park Lane is well located for exploring London. Sandwiched between Hyde Park and Green Park, the hotel overlooks Marble Arch. Opposite Hyde Park and Green Park, the InterContinental London Park Lane has wonderful views of the royal parks and Marble Arch and it's a mere ten minute walk to Oxford Street. What a location. A £76 million restoration in 2006 gives the hotel's 447 guest rooms and 60 expansive suites a contemporary feel and top class facilities include a full-service spa, a ballroom and further 12 meeting rooms featuring floor-to-ceiling windows overlooking Park Lane. Michelin-starred chef Theo Randall runs the restaurant and the Cookbook Cafe, the hotel's breakfast room, caters for more casual dining. Park Lane is among the smartest addresses in London and the global flagship of the InterContinental chain thoroughly lives up to its location. Top quality ingredients transformed into simple rustic Italian dishes. For 15 years he was head chef and silent partner alongside Ruth Rogers and Rose Gray at the famed River Cafe then in 2006 Theo Randall set up his first restaurant at the Intercontinental Hotel on London's Park Lane. "It may be costly," said Jay Rayner reviewing the restaurant when it first opened, the hotel fresh from a £74 million renovation, but "this restaurant served me the best meal I have eaten all year". And it still impresses today. While there are no ground-breaking dishes what you do get is top quality ingredients prepared in the same simple rustic dishes you enjoy when you go to Italy. The tasting menu gives you a bit of everything - scallops, veal capelletti, fillet steak, cheese and afogato - or opt for a la carte and choose lovely dishes like buffalo mozarella followed by lobster linguini. The wine pairings for the tasting menu are superb and desserts include a sharing platter of pannacotta, soft chocolate cake, coffee ice cream, and the signature amalfi lemon tart which comes highly recommended. The casual Cookbook Cafe features over 200 original cookery books and a great brunch. 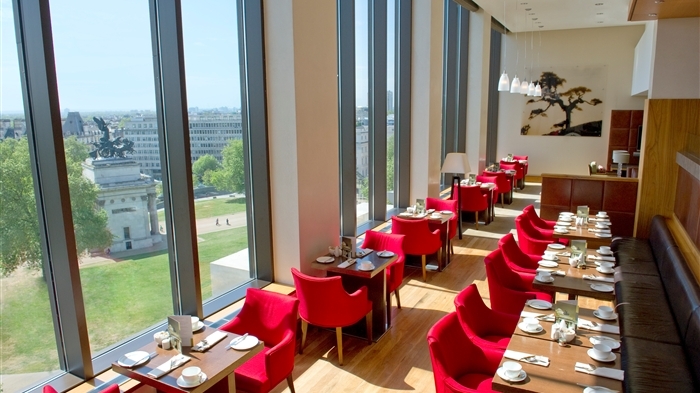 This casual restaurant, the breakfast room at the InterContinental London Park Lane, is quirkily decorated with installations and flooded with natural daylight from enormous windows that face towards Hyde Park. Cookbook Cafe features over 200 original cookery books ranging from rare antiques to modern day collections. Cooking stations are centrally located, allowing the restaurant's artisan chefs to demonstrate their skills and interact with the customers. With an atmosphere that is casual and comfortable, staff that are friendly and informed, and a bright inviting decor, this venue is a breath of fresh air. A permanent fixture at Cookbook Cafe is the relaxed Sunday Brunch which includes Bellinis, Bloody Marys and Ice Tea Martinis, with chilled tunes from the DJ, weekly from 12 noon to 4pm. Cookbook Cafe runs regular Master Classes and Cooking Workshops. Five cocoon-shaped therapy suites and state-of-the-art facilities. Located on the 1st floor, Spa InterContinental's 300 metre squared urban retreat features five cocoon-shaped therapy suites and state-of-the-art facilities including a steam temple suite with hydrotherapy showers, and a dry flotation therapy room. A wide range of treatments are on offer, carried out using British skincare brand Elemis and by an expert team of therapists. Lighting, music and aromas are customised to match your personal preferences but if it's privacy you want ask for the VIP suite and you'll get couple's treatment beds and your own lounge. On the same floor is the Fitness Suite, flooded with natural daylight, it provides all the latest cardiovascular equipment and plenty of space for free weights and stretching. From cheap budget hotels to luxury 5 star suites see our discounts for hotels, including Grange Langham Court Hotel from 65% off.